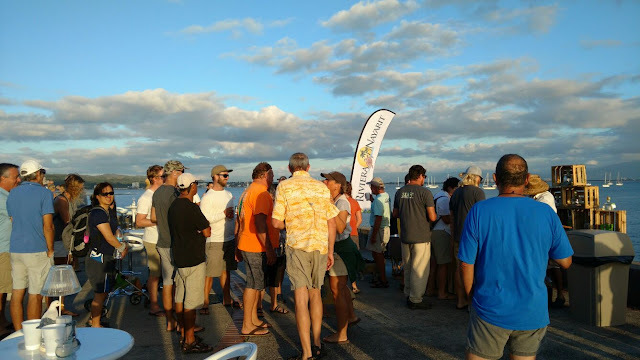 Between 120 and 150 Cruisers arrived at the Marina Riviera Nayarit and will sail out over the region, spending the winter season in friendly competitions in preparation to take home the prize in the Banderas Bay Regatta. December 13th marked opening day for the 4th Annual Sailors’ Splash in the Marina Riviera Nayarit in La Cruz de Huanacaxtle. Sailors from all over North America congregated in the Riviera Nayarit to finalize the XXII Baja Ha-Ha competitions. As they do every year, the Riviera Nayarit Convention and Visitors Bureau (CVB) lent their support with the grand opening cocktail, attended by Israel Díaz, the Riviera Nayarit’s Mixology Ambassador who prepared his signature tequila drinks: Mango with Chile, Blackberry with Coffee and Pineapple with Ginger and Mint. Between 120 and 150 vessels have arrived for the winter season in the Destination. The first regatta took place this past weekend. Known as the Banderas Bay Blast, it lasted through Tuesday, December 15th. This competition serves as a welcome for all the participating sailors who hail mainly from California. It’s also the last competition of the Baja Ha-Ha. From now through the month of May, this group of 150 sailors with their friends and families will live in the regional marinas; every Wednesday they will be involved in friendly competitions in preparation for the Banderas Bay Regatta. Their stay signifies important revenue for the region for the next six months, as they are tourists who rent vehicles, purchase local food and beverage products, eat out at restaurants and secure lodgings in hotels, among other services. The Cruiser sailboats used for competition are the same ones that have been traveling from north to south along the Pacific; this is one of the many features only offered by the Riviera Nayarit, as there is no other regatta that allows them to participate with the same vessel that they use for travel.